A patient’s experience in healthcare today is dominated by frustrations about limited access to care, extensive wait times, overfilled facilities, and minimal time with the provider. Patients across demographies desire increased value, quality, and service during their medical journey and a better overall patient experience. For a successful transition to a value-based system it is imperative to invest in engagement technologies that improve patient health outcomes while decreasing the costs of care delivery. Phrazer/Kitsune is a medical journey solution for equitable, patient centered engagements that simultaneously share critical information with staff and enable top of licensure performance. Additionally, Phrazer/Kitsune offers efficiency benefits leading to a new level of operational excellence in concert with novel revenue pathways. When determining the financial benefit of your Phrazer/Kitsune program the consideration of not only hard savings but also new vital benefits not previously calculated. Hard savings include the standard cost measures while soft savings are less tangible, but equally important such as care plan adherence, patient confidence, community health and more. 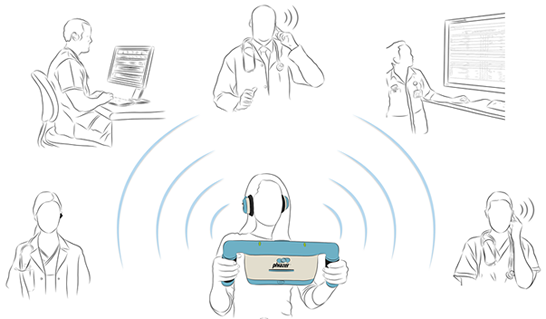 With Phrazer/Kitsune, all locations in your facility become active care zones where patients progress care through relevant, patient-centered CITE engagements. What does that mean for your economics? Phrazer/Kitsune sets a new standard of speed to treat (AKA ‘door-to-doctor’) within 3 min. across all demographies without the need for translation or charting services. The novel system vastly reduces charting time for staff, eliminates medical error caused by communication barriers, integrates process adherence that increases compliance with quality procedure and that ultimately supports delivering excellent care. When patient understanding and compliance with care instructions is increased, the overall experiences for staff and patients is improved. With Phrazer/Kitsune it is proven that patients are more deeply engaged in their care, happier and experience healthier results while processes are more efficient. All these benefits, and more, impact your value calculation. Even with the enhanced performance provided via Phrazer/Kitsune to total cost is less than $0.02 per minute vs. over $1.66 per minute for conventional methods. Do you want to know how Phrazer/Kitsune can improve your specific key measures? Get in touch with us today!